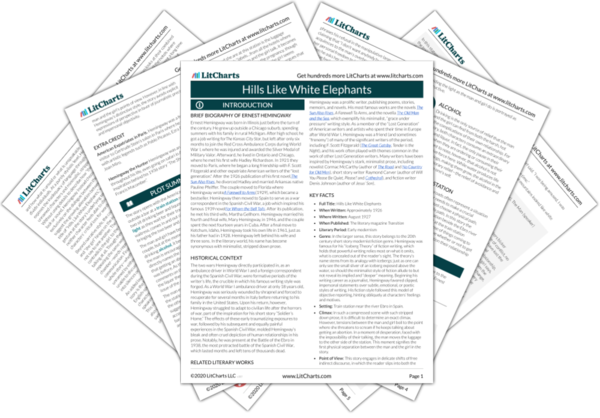 Instant downloads of all 942 LitChart PDFs (including Hills Like White Elephants). 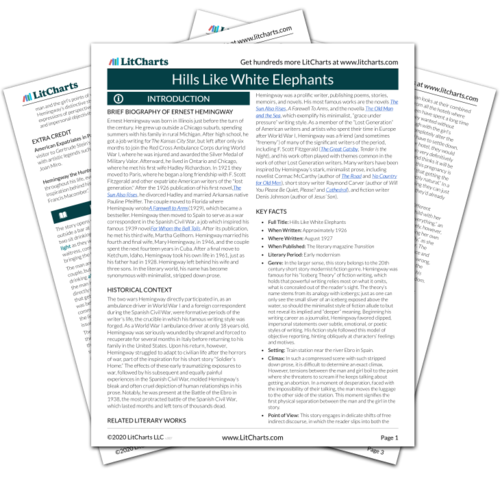 Welcome to the LitCharts study guide on Ernest Hemingway's Hills Like White Elephants. Created by the original team behind SparkNotes, LitCharts are the world's best literature guides. A concise biography of Ernest Hemingway plus historical and literary context for Hills Like White Elephants. A quick-reference summary: Hills Like White Elephants on a single page. In-depth summary and analysis of every of Hills Like White Elephants. Visual theme-tracking, too. Explanations, analysis, and visualizations of Hills Like White Elephants's themes. Hills Like White Elephants's important quotes, sortable by theme, character, or . Description, analysis, and timelines for Hills Like White Elephants's characters. Explanations of Hills Like White Elephants's symbols, and tracking of where they appear. An interactive data visualization of Hills Like White Elephants's plot and themes. Ernest Hemingway was born in Illinois just before the turn of the century. He grew up outside a Chicago suburb, spending summers with his family in rural Michigan. After high school, he got a job writing forThe Kansas City Star, but left after only six months to join the Red Cross Ambulance Corps during World War I, where he was injured and awarded the Silver Medal of Military Valor. Afterward, he lived in Ontario and Chicago, where he met his first wife Hadley Richardson. In 1921 they moved to Paris, where he began a long friendship with F. Scott Fitzgerald and other expatriate American writers of the "lost generation." After the 1926 publication of his first novel,The Sun Also Rises, he divorced Hadley and married Arkansas native Pauline Pfeiffer. The couple moved to Florida where Hemingway wroteA Farewell to Arms(1929), which became a bestseller. Hemingway then moved to Spain to serve as a war correspondent in the Spanish Civil War, a job which inspired his famous 1939 novelFor Whom the Bell Tolls. After its publication, he met his third wife, Martha Gellhorn. Hemingway married his fourth and final wife, Mary Hemingway, in 1946, and the couple spent the next fourteen years in Cuba. After a final move to Ketchum, Idaho, Hemingway took his own life in 1961, just as his father had in 1928. Hemingway left behind his wife and three sons. In the literary world, his name has become synonymous with minimalist, stripped down prose. 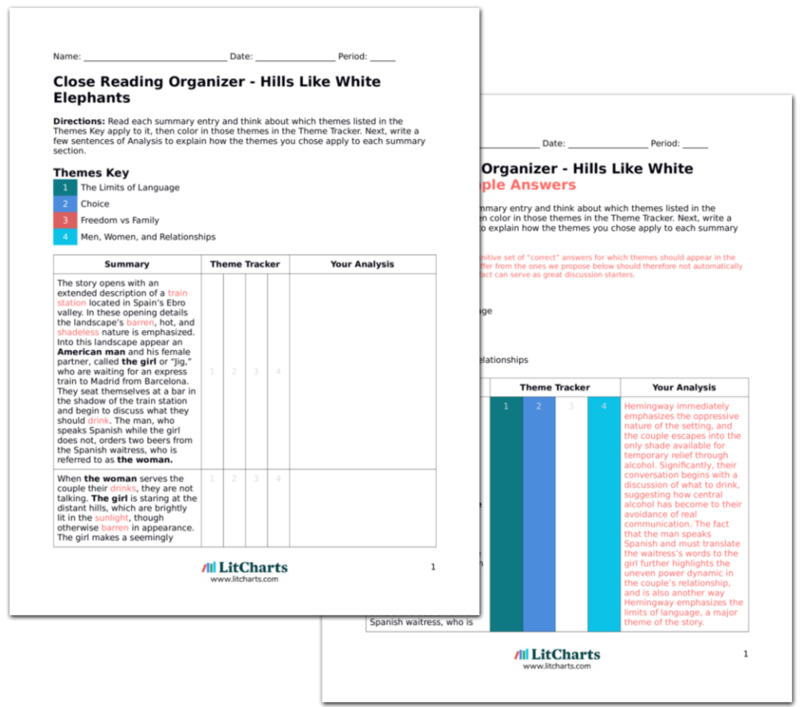 Get the entire White Elephants LitChart as a printable PDF. The two wars Hemingway directly participated in, as an ambulance driver in World War I and a foreign correspondent during the Spanish Civil War, were formative periods of the writer’s life, the crucible in which his famous writing style was forged. As a World War I ambulance driver at only 18 years old, Hemingway was seriously wounded by shrapnel and forced to recuperate for several months in Italy before returning to his family in the United States. Upon his return, however, Hemingway struggled to adapt to civilian life after the horrors of war, part of the inspiration for his short story “Soldier’s Home.” The effects of these early traumatizing exposures to war, followed by his subsequent and equally painful experiences in the Spanish Civil War, molded Hemingway’s bleak and often cruel depiction of human relationships in his prose. Notably, he was present at the Battle of the Ebro in 1938, the most protracted battle of the Spanish Civil War, which lasted months and left tens of thousands dead. Hemingway was a prolific writer, publishing poems, stories, memoirs, and novels. His most famous works are the novels The Sun Also Rises, A Farewell To Arms, and the novella The Old Man and the Sea, which exemplify his minimalist, “grace under pressure” writing style. As a member of the “Lost Generation” of American writers and artists who spent their time in Europe after World War I, Hemingway was a friend (and sometimes “frenemy”) of many of the significant writers of the period, including F. Scott Fitzgerald (The Great Gatsby, Tender is the Night), and his work often played with themes common in the work of other Lost Generation writers. Many writers have been inspired by Hemingway’s stark, minimalist prose, including novelist Cormac McCarthy (author of The Road and No Country for Old Men), short story writer Raymond Carver (author of Will You Please Be Quiet, Please? and Cathedral), and fiction writer Denis Johnson (author of Jesus’ Son). Genre: In the larger sense, this story belongs to the 20th century short story modernist fiction genre. Hemingway was famous for his “Iceberg Theory” of fiction writing, which holds that powerful writing relies most on what it omits, what is concealed out of the reader’s sight. The theory’s name stems from its analogy with icebergs; just as one can only see the small sliver of an iceberg exposed above the water, so should the minimalist style of fiction allude to but not reveal its implied and “deeper” meaning. Beginning his writing career as a journalist, Hemingway favored clipped, impersonal statements over subtle, emotional, or poetic styles of writing. His fiction style followed this model of objective reporting, hinting obliquely at characters’ feelings and motives. Setting: Train station near the river Ebro in Spain. Climax: In such a compressed scene with such stripped down prose, it is difficult to determine an exact climax. However, tensions between the man and girl boil to the point where she threatens to scream if he keeps talking about getting an abortion. In a moment of desperation, faced with the impossibility of their talking, the man moves the luggage to the other side of the station. This moment signifies the first physical separation between the man and the girl in the story. Point of View: This story engages in delicate shifts of free indirect discourse, in which the reader slips into both the man and the girl’s points of view. However, in line with Hemingway’s distinctive style, the story avoids explicit expressions of perspective in favor of journalistic precision and impersonal objectivity. American Expatriates in Paris. Hemingway was a frequent visitor to Gertrude Stein’s salon in Paris where he socialized with artistic legends such as Pablo Picasso, Ezra Pound, and Joan Miro. Kaisler, Max. "Hills Like White Elephants." LitCharts. LitCharts LLC, 9 May 2016. Web. 18 Apr 2019. Kaisler, Max. "Hills Like White Elephants." LitCharts LLC, May 9, 2016. Retrieved April 18, 2019. https://www.litcharts.com/lit/hills-like-white-elephants.